Recently, I came to terms with something that many of my customers feel: I had a web site for my business, but I found that I really wasn’t using it that much. It was there, but it wasn’t great. It still worked very well, but the overall design was dated. We were busy building sites for others and it was hard to carve out time to update our own. It was time for a change. I just needed to figure out what I wanted to say and how I was going to say it, so that my web site could be a business tool that my customers and I actually would utilize. Our last web site was ahead of the curve. It was an early adopter of mobile-friendly design and a showcase for how it works and why it was important. Since then, we haven’t built a site without those same properties. It’s even more important than ever for your web site to work on any device out there. 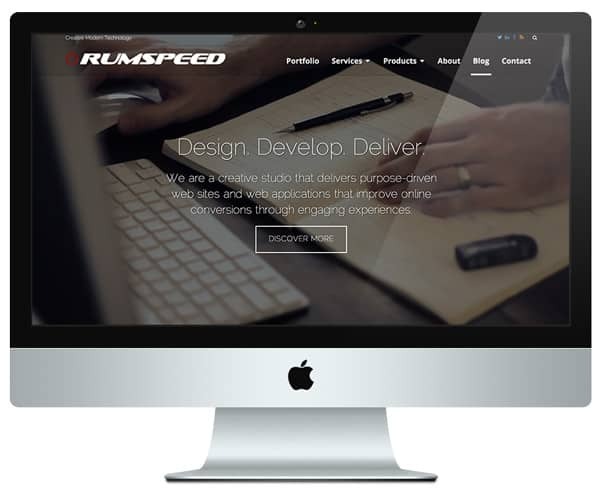 This includes our business web site for Rumspeed. We pulled more content from our web site than we added. I love this strategy. After reviewing all site pages, posts, portfolio items and service pages, it was clear that we needed to trim it down; less is more. It’s easier to read, because there are fewer things to read. In other words, there is more focused content with supporting images. That goes a long way. Our site was in need of an overhaul and that’s exactly what we did. Also, we needed to practice what we preach by refreshing the blog and writing about what we do. Publish to your blog, syndicate everywhere. The new site is built using our updated web site framework for increased flexibility and improved design layouts, with larger fonts, images and greater separation of content to help the pages flow better. The Web Design page now automatically pulls in the three most recent web design projects, so when the page gets updated, the portfolio is updated. Furthermore, every page should do something, so there is a call-to-action on every single page. Blog Post, Portfolio, and Service Pages all have a button for the visitor to do something next. We built a new site to better showcase our modern web design and web development projects. We’re known for publishing well-designed sites with great user experiences, but we hadn’t updated our portfolio in over a year. This is in part because we knew a new site was needed and sometimes it’s just difficult to add new content to an old site. It happens to our customers and it happened to us. We didn’t even show off our web development projects — cool projects that didn’t have a story. It was time to showcase what we do at Rumspeed and what can be done. You’ll notice that this entire web site is encrypted. Look for the green lock in the browser address bar. We upgraded to a secure web site protocol: We’re now delivering all site assets using HTTPS. The “S” notes the use of a secure protocol; it’s encrypted, which gives a boost to the Search Engine rankings too.